Preheat oven to 350Â°F. Line a large cookie sheet with parchment or a Silpat (rubber nonstick baking mat). Using an electric mixer, beat the butter in a bowl until light and fluffy. Add both sugars, salt, and vanilla, and beat until well mixed, about 3 minutes. Stir in eggs, one at a time. Sift together the flour, baking soda, cinnamon, nutmeg, and clove in a separate bowl. Add half of the flour mixture to the butter with the mixer on low speed. Once the flour has been incorporated, add the second half. Stir in the oats, pecans, orange zest, and chocolate chips. 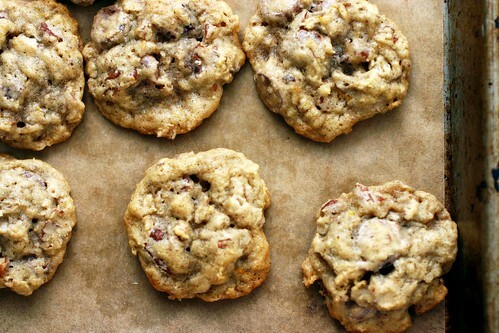 Drop the dough, by the tablespoon, onto the cookie sheet and bake for 10-12 minutes or until golden. Remove from the oven and cool the cookies on a rack. Store at room temperature in a cookie jar or other airtight container.